How Long Should I Be Able To Balance on One Leg? In physical therapy school I was taught that a young adult should be able to stand on one leg for 30 seconds with their eyes closed. I assumed this number was derived from a large study measuring the average balance time from a large number of individuals but I never took the time to look it up. One day a patient of mine challenged the 30 second standard and so I looked it up. 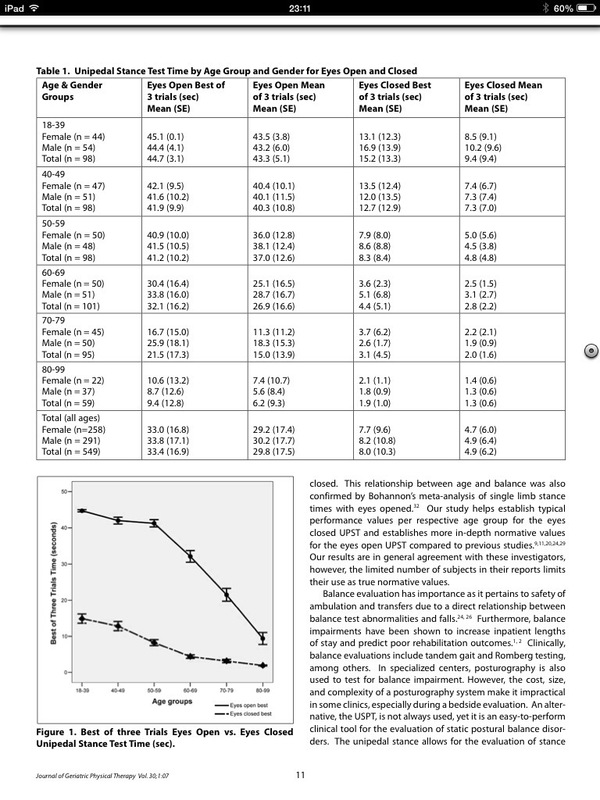 The best study I found was published in the Journal of Geriatric Physical therapy by lead author Barbara Spriger PT,PhD,OCS,SCS titled Normative Values for the Unipedal Stance Test with Eyes Open and Closed. 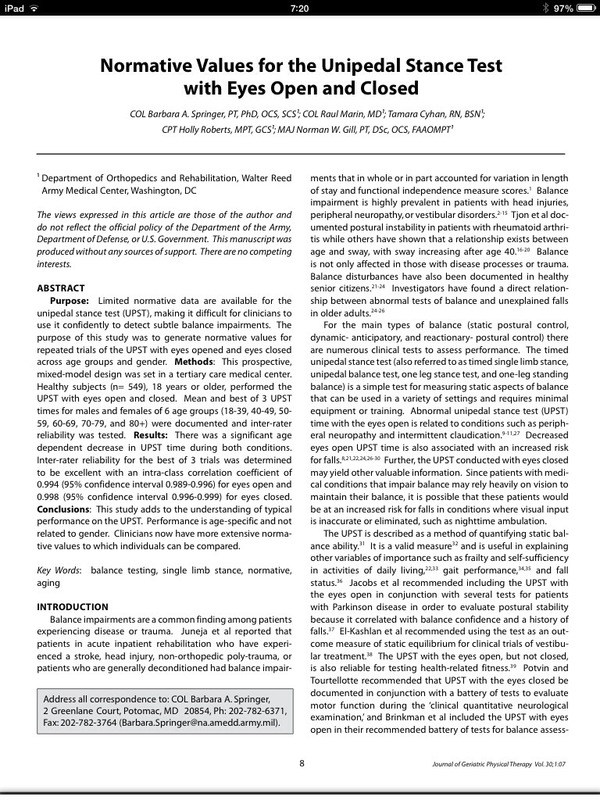 This study tested single leg balance in 549 people at the Walter Reed Army Medical Center in Washington DC. The subjects were recruited by a flyer posted in the waiting room. Subjects were excluded if they had any known history of balance impairment, were pregnant, had a lower extremity or lumbosacral condition requiring medical care or peripheral neuropathy. -Repeat the test the same way with eyes closed, stop the timer if you open your eyes. A strong relationship was found between advancing age and declining balance. Eyes open balance stays in the 40s range until age 50 then begins to drop by about 10 seconds for each decade after 60. Eyes closed balance is a third of the duration of eyes open balance and drops by about 4 seconds each decade after age 50. The average of 15 seconds with eyes closed for 18-39 an year old surprised me, it was much less than I had been taught. Detailed results are below, see how you compare. The springer study strictly measured the length of time the subjects were able to stand on one leg. Many people who study the musculoskeletal system contend that the way you stand on one leg is important as well. 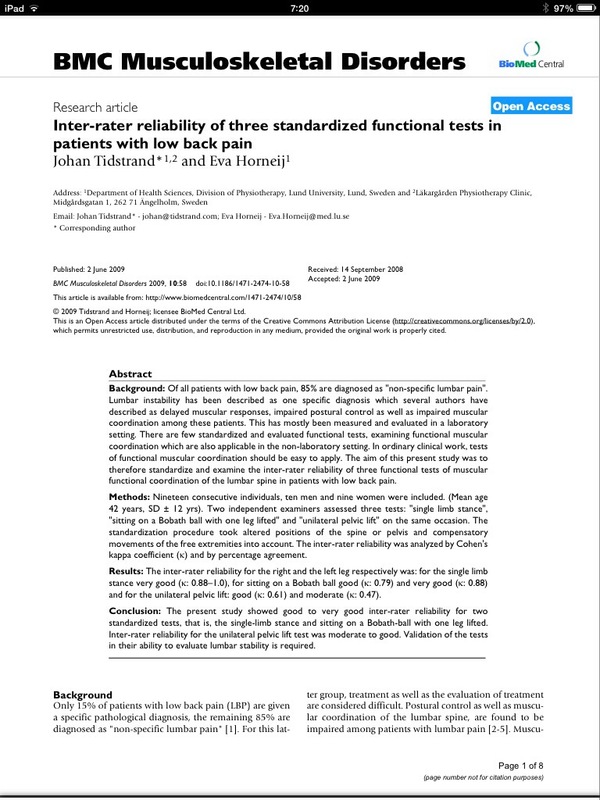 One example of this is Johan Tidstrand and Eva Harneij’s study in 2009 on the “inter-rater reliability of three standardized functional tests in patients with low back pain” where they graded the amount one leans over when standing on one leg. More lean suggests more lumbo-pelvic instability. Their study found it was a reliable test, it remains to be proven how well this test can predict outcomes or direct treatment effectively. The simplest and most straightforward way to improve your single leg balance is to practice standing on one leg. Getting in the habit of practicing while you brush your teeth each day is a good way to start. 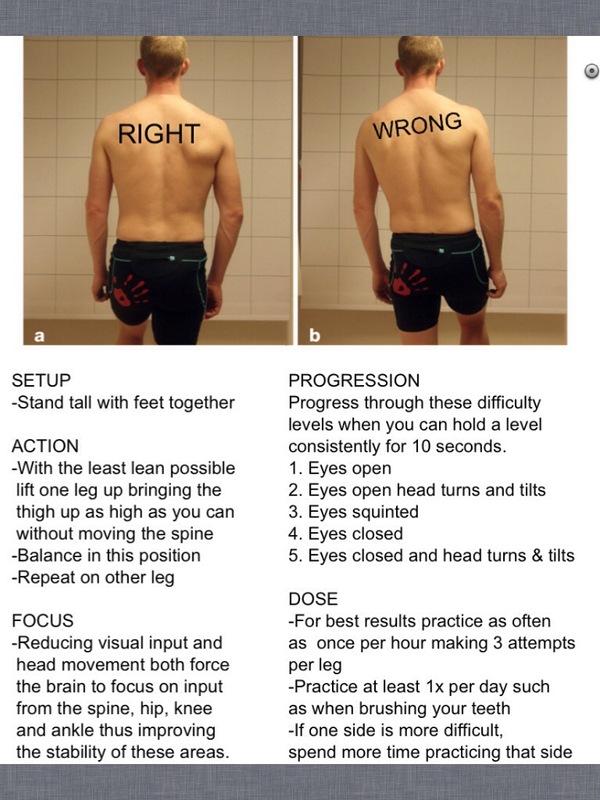 Follow the guidelines I have written below to ensure that your improvements in single leg balance come with the best possible demonstration of posture. The photo is from the Tidstrand study. Thanks for this. I was told one-leg-eyes-closed 30 secs, and found it unlikely. I’m confused by the data. You quote mean = 15 secs, but the table shown has mean = 9.4 secs. What am I missing? Hi Meg, thanks for your comment. When recording only the best of three trials, the average for the 18-90yr/old group was 15sec. However, the average of the average of all the three trials for this group was 9.4 sec. Got it, so even the *best* trial averaged at 15 secs. Good to know. I’m aiming to get past 5 secs, and then I’ll aim higher maybe. I’m 68. Thanks. At age 68 you are above the average, but shoot higher. A large study found that people who could not stand on one leg for 5 seconds were 2.1x more likely to have an injurious fall. Vellas et al 1997 “One-leg balance is an important predictor of injurious falls in older persons. J Am Geriatr Soc. I’m in my late 30s now, but I read of something like the 30 second claim when I was around 11 and set out to see how much I could better it. I don’t quite remember how long I went, but I did it a number of times that year during school recess on the playground with my friend timing and talking to me while I had my eyes shut. I did it for several minutes at a time. It means you are either flexible, do gymnastics, or are very tiny and have no ear problems such as allergies. Nothing more than that. Does not mean you do not have other health issues or will live longer than others who have problems. I would say the important time to test is once you pass 50. Heh, that was pretty on the nose. Hypermobile, did gymnastics until age 13, on the smaller side in terms of height and weight. However, I do have allergies that affect my ears: my eustacian tubes are blocked a lot of the time.